In his State of the Judiciary address Wednesday, Texas Supreme Court Chief Justice Nathan Hecht discussed bail reform, the cost of legal expenses, mental health issues and a host of other topics. Texas Supreme Court Chief Justice Nathan Hecht delivered his State of the Judiciary Address in the state House chamber on Feb. 1, 2017. 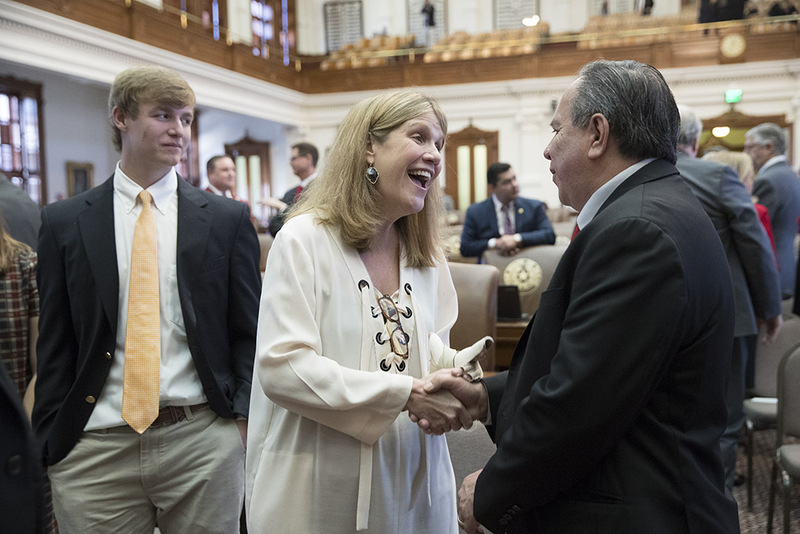 The state of the Texas judiciary is strong — because of judges like Julie Kocurek, Texas Supreme Court Chief Justice Nathan Hecht said Wednesday during a joint meeting of the Texas House and Senate. Kocurek, a state district judge in Travis County, was shot outside her home in late 2015 by a man who once appeared in her courtroom. She was hospitalized for several weeks, had almost 30 surgeries and lost a finger, Hecht said during his State of the Judiciary address. "I asked Julie about her plans," the chief justice said. "She could retire. She was eligible. But if she left the bench, people would think you can threaten a judge and scare her off, maybe scare off other judges, intimidate them, show that justice cannot stand up to violence. She would not do that." The attack on Kocurek highlighted gaps in security for judges, courthouses and their staff, Hecht said. He said those gaps include "inadequate training, communication and security protocols; inadequate resources; no state-level direction; and the ready availability of judges' personal information in publicly searchable government databases." Hecht said he wants legislation named in Kocurek's honor. Security for judges was among many topics that Hecht discussed Wednesday. What Kocurek endured is an example of the "personal sacrifice" she and other judges make – and they should be paid with that and cost of living, salaries in other states, private sector pay and other factors in mind, Hecht told lawmakers and other state officials. Hecht asked lawmakers to continue funding legal services for veterans and sexual assault victims. Legal costs are also a problem for the middle class and small businesses, Hecht said. The chief justice said he and colleagues in the judicial community are looking at recommendations to lower the costs of legal services. "If justice were food, too many would be starving," he told lawmakers. "If it were housing, too many would be homeless. If it were medicine, too many would be sick. If it were faith, too many houses of worship would be closed. The Texas judiciary is committed to doing all it can to close the justice gap, and we are grateful for your support." Hecht advocated for a statewide, electronic court document system, saying it would be more convenient and reduce costs. The federal court system has PACER, which hosts court documents from across the country. Two decades ago, Hecht said, one-third of the state jail population awaited trial. That figure has ballooned to three-fourths, he said. "Liberty is precious to Americans, and any deprivation must be scrutinized." The chief justice used the example of a woman arrested for shoplifting $105 in clothes for her grandchildren. She was jailed for about two months because her bail was set at $150,000. "This makes no sense," he said. "Like the bail system, ineffective approaches to mental illness cost defendants, the courts, the government and society," he told lawmakers. "The Judicial Council recommends changes in the Code of Criminal Procedure to allow more effective management of mentally ill criminal defendants and better procedures for obtaining treatment, medication, and restoration. I urge you to consider them." More than 2,000 judges across the state last year worked 7 million traffic and minor offenses, Hecht said. Some paid the fines and went on with their lives. In about 640,000 cases (16 percent), defendants were jailed, he said. "Jailing criminal defendants who cannot pay their fines and court costs — commonly called debtors’ prison — keeps them from jobs, hurts their families, makes them dependent on society and costs the taxpayers money," Hecht said. "Most importantly, it's illegal under the United States Constitution. Judges must determine whether a defendant is actually unable, not just unwilling, to pay a fine. A defendant whose liberty is at stake must be given a hearing and may be entitled to legal counsel, another expense for the state." Hecht recommended that the Office of Court Administration's guardianship compliance pilot project — which reviewed 10,000 cases of aging and incapacitated Texans who need help managing their affairs — be expanded statewide. Texas has about 50,000 active guardianship cases and involves $5 billion, the chief justice said. Hecht asked legislators for financial assistance to continue funding the Texas Supreme Court's Children's Commission, which trains judges and lawyers handling children, foster care and human-trafficking cases. "The commission has always operated with federal grant funds," Hecht said. "Until those grants are again funded, I must ask this Legislature to make up the difference. Any lack of support for the commission now would be a sharp blow to improvements in the foster care system the Legislature is considering. Texas’ greatest asset by far is her children. The commission helps preserve that asset for us all." Candidates at the top of the ticket in the previous election affected judicial elections, Hecht said. Removing judges from the straight-ticket voting option might be a solution, he said. "In November, many good judges lost solely because voters in their districts preferred a presidential candidate in the other party," he said. "These kinds of partisan sweeps are common, with judicial candidates at the mercy of the top of the ticket. I do not disparage our new judges. I welcome them. But my point is only that qualifications did not drive their election; partisan politics did." Partisanship is harmful, he told guests. "Such partisan sweeps are demoralizing to judges and disruptive to the legal system," Hecht said. "But worse than that, and this is what I want to say: When partisan politics is the driving force, and the political climate is as harsh as ours has become, judicial elections make judges more political, and judicial independence is the casualty." Hecht touched on the relationship between law enforcement and civilians. "Judges across the country are concerned that recent tensions between law enforcement and communities, which have weakened our institutions, [could] erode public trust in the courts," Hecht said. "Trust is the judiciary’s most important asset. People must not think the justice system is rigged. As the country works through its political and social differences, we want all to have utter confidence in the courts to be fair, to hear all sides, and to provide equal justice under law." Seventeen-year-olds can't vote, join the military or buy cigarettes or alcohol, but they're treated as adults in criminal cases in Texas. About 200 people rallied at the Capitol on Monday to change that. Texas lawmakers are likely to take a close look this legislative session at how law enforcement and civilians interact with each other.